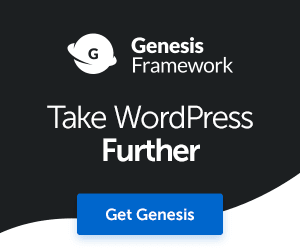 I started working full time, so I haven’t been blogging much. 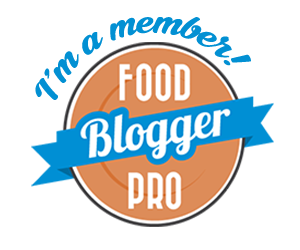 But I’ve still been cooking—although I’ve been gravitating towards easier meals that take less prep time. Which is more realistic for most people anyway. So I’ve made these quesadillas for dinner a couple times because they’re easy and yummy. 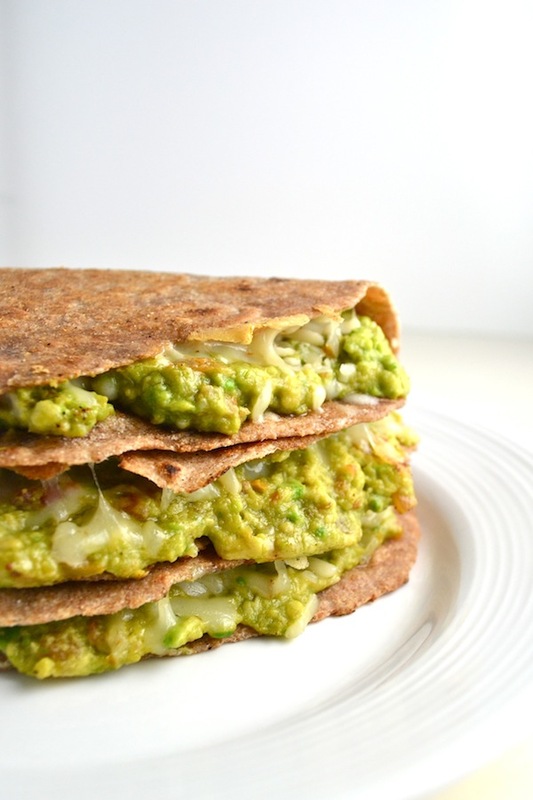 My mom made these avocado quesadillas for us growing up. And she didn’t even like them. She liked cheese quesadillas sans avocado. So she’d make these for us and cheese quesadillas for herself. Moms. They’re so nice, you know? 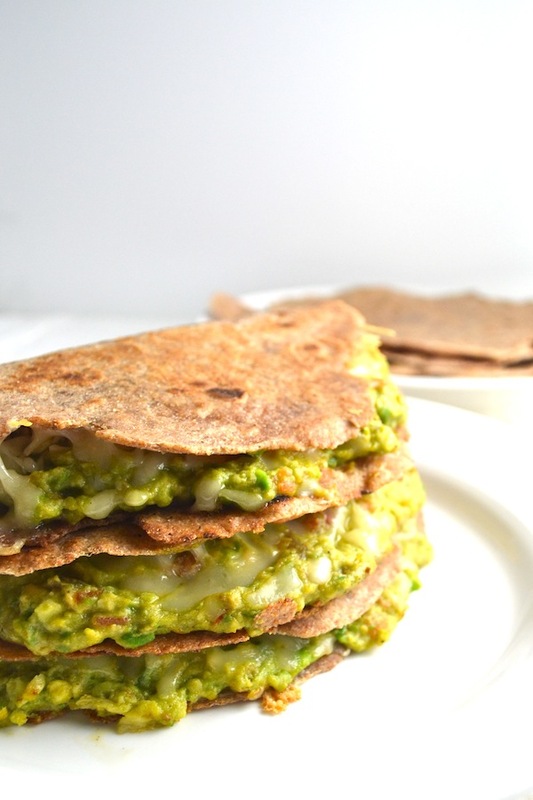 My mom didn’t make homemade tortillas, but these homemade sprouted wheat tortillas make the quesadillas even better. 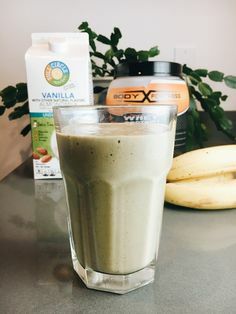 Not necessary, but extra healthy and extra good. 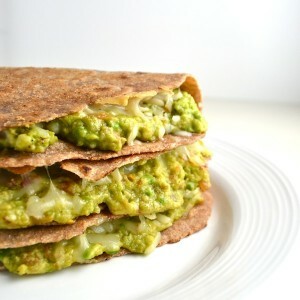 So, avocado quesadillas are really simple to make. 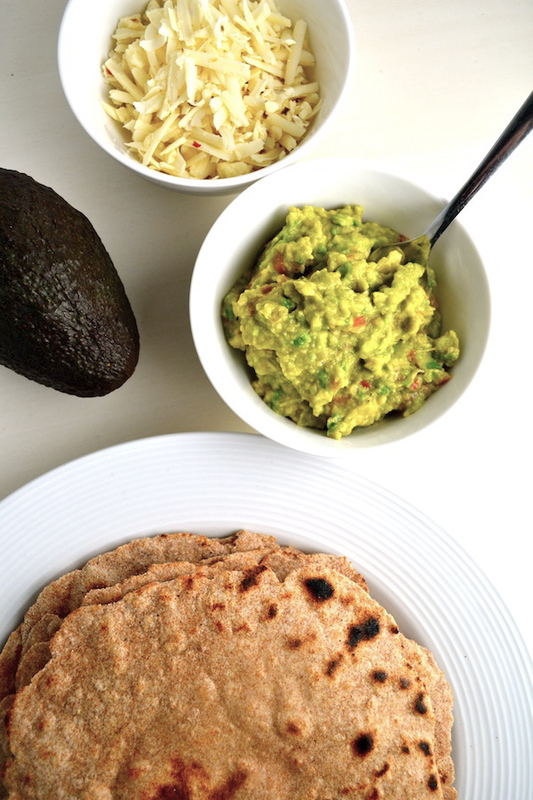 All you need are some ripe avocados, your favorite salsa, limes, cheese, tortillas, and butter. As always, use high quality ingredients to make these quesadillas extra good. I like to use Organic Valley Raw Cheddar Grass-fed Cheese, Kalona SuperNatural Butter, and Muir Glen Organic Salsa. Cut the avocados in half, remove pit, scoop avocado onto a plate or cutting board. Mash avocado with a fork and then put into a bowl. Cut lime in half and squeeze juice onto avocado. Add salsa and stir together until combined. Take a tortilla and spread ¼ of the avocado mixture onto one side of it. Sprinkle cheese on top of the avocado. Place the quesadilla in the hot pan and cook until the tortilla is brown and the cheese has begun to melt, about 1 minute. Flip the tortilla to the other side and cook until the cheese if fully melted, about 1 minute. Serve hot, topped with more salsa or sour cream. Ugh this combo is perfect! I believe guac goes well with everything! Our constitution accepts only children of SC father can inherit SC benefits and not of the SC mother!!! regarding bringing up kids as general category, you can do any thing you want just dont thing that the father of your children is SC, rest will work as usual. You can mention their caste in their birth certificate or by affidavit as general. How you nurture your child is your business and no one else. Stephanie, we know that you are only doing this for political reasons, and that is a shame. The comments section will follow the lead of the New York Times and the Associated Press and continue to use the terms illegal alien or illegal immigrant. Okay so for some reason Pink Diva just popped into my head, it's soft and spicey right! 😉 Hope you like the name!! Love, love, love the owl scentsy! I have a plain one and love the smells…need to get the new one…sounds exciting!